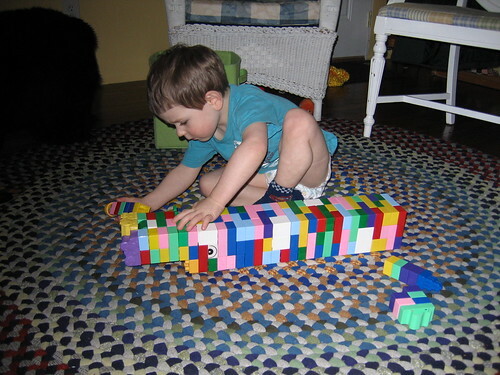 Here is a picture of my 'important' work from last week - building a 'big building'! I have no excuses now for getting nothing done! Today I got my charm squares cut and mailed for round 2 of the Mini Quilt In A Bag Swap. I decided I couldn't justify buying a charm pack to send when I have so much fabric already. 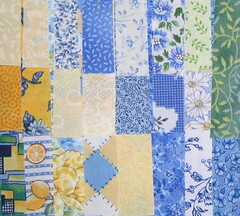 I haven't received my quilt from the last round yet but I should soon - it is on its way from Australia I believe. This afternoon I hope to get the second quilt back finished so I can look at a good day to take one down to my friend's house to try out her new long arm machine. Today I also bought one of those roll-around sewing machine case things - though technically it is for scrapbooking. I am going to use it for my plane trip to the quilt retreat in a couple of weeks and when I looked at the ones made for sewing machines they just looked so huge and I am just taking a Singer 301 so I took a chance and bought this one and it is a perfect size for my machine and I can pack my projects around it for a little padding for the trip. All the sharp things like rotary cutter and scissors will be in my checked bag. I finally broke down and order a portable sewing table for the retreat also. I had it sent to my sister's house since I will be there for a couple of days before the retreat and I didn't want to have to figure out how to get it on the plane! I bought and extra insert so I can use it for my two favorite machines. I hope it works out well! Well, I had better get to that back or it will never get done!